Comment: Frankfurt 2015 – connection error? Motor shows must have a theme these days, because just like modern nuptials, it’s no longer enough to simply say “let’s gather to celebrate this thing we love”. So, as per the zombie apocalypse wedding you went to last month, this month you can attend “Mobility Connects" in Frankfurt, which is the 2015 show's theme and basically about our inexorable advancement to self-driving cars. This too is apocalyptic, if the latest news reports are to be taken to their logical conclusion. It was reported a couple of weeks ago by a tabloid newspaper that the immobiliser used by a handful of major car manufacturers, most notably Volkswagen Group, could be decrypted remotely using a cheap homemade device. The result: a car with keyless start system can be fooled into thinking the key is close, started, then driven away. And the more ‘connected’ your car is – as in, the more of its features that are being transmitted through the airwaves – the more vulnerable it is to the sort of people that steal naughty pictures from a celebrity’s phone and publish them on the internet. That's according to internet expert types. "They tried to charge me £250 for a new key? Needless to say I had the last laugh..."
It’s a sobering enough thought, for those of us that love driving, that our cars will soon no longer need to be driven – but it’s even worse to imagine that they’ll be able to be driven remotely, from a laptop, by a malevolent nerd. But according to Google’s statistics, 94 per cent of car accidents in America are the result of driver error, and the company uses this statistic as the key driver, so to speak, in pushing on with its own autonomous car. It’s ironic, then, that in making cars safer this way, it opens up an even more harrowing danger. But it’s happening, and you can’t stop it. Alongside Google, Apple is rumoured to be developing a car, which will no doubt have some element of autonomy. And then there are the car companies themselves, with Nissan, Audi, BMW, Jaguar Land Rover and Merecedes-Benz all known to be developing the technology – and demonstrating it already. Oh, and the British Government has even got in on the act, promising £19m of R&D funding towards the matter this year alone. In some ways this is a very exciting prospect – after all, which of us, given the choice between reading a newspaper on the M1 between London and Newcastle, or actually driving it, would choose the latter? Would you rather be doing a crossword or dealing with yet another middle lane idiot? "I know I asked for a large print edition, but this is ridiculous." Whatever your view, we should all be getting excited/terrified at the imminent prospect of driverless cars now, right? I mean, it’s the theme of a whole motor show. Well, no. 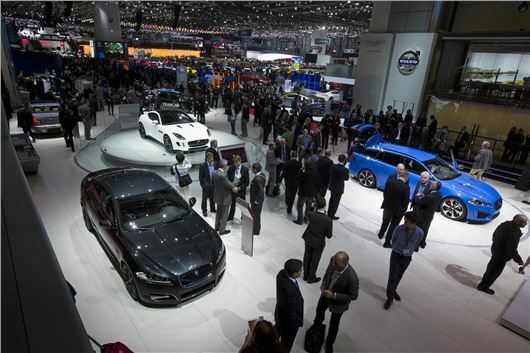 Want to know how many driverless cars are due to be unveiled at the Frankfurt motor show? None. That’s right, not one. What we’ll actually get is a couple of manufacturers talking about swipey touch screens and iPhone apps. And, possibly, we’ll get the vague threat of radar cruise control 3.0, which will overtake for you but will be legally obliged to sound a piercing siren and furiously flash 1000W bulbs every time it does so, to make sure you’re paying attention at all times, just in case you have to manually prevent it from barrel rolling the car. Mercifully, the Frankfurt stands will be full of the same old, same old. That’s brilliant. There’ll be flashy new SUVs, like the Bentley Bentayga, Jaguar F-Pace and Maserati Levante, and there’ll be flashy new saloons, like the new Audi A4, BMW 7 series and Alfa Romeo Giulia (below). And there’ll be flashy compact cars, like the new Infiniti Q30 and BMW X1, and flashy coupes, like the Mercedes-Benz C-Class one. And there’ll be new versions of the ordinary stuff that we all buy, like the new Vauxhall Astra, Renault Megane, Kia Ceed and Fiat 500. And then there’s the updated Porsche 911, a new Lotus sports car, a convertible Ferrari, a convertible Lamborghini, and an enormous new MINI. It goes on and on. To be honest, it all makes you wonder why Frankfurt’s organisers are so obsessed with peering into the potentially apocalyptic future – because in doing so they’re leapfrogging all the brilliant things that are happening right now. So our advice…forget about all this “mobility connects” marketing bluster and make the most of mobility while it does actually connect you to something real. There are some amazing cars coming, and you can drive every one of them, while actually sitting inside them. How excting is that?